Lt. Gen. Thomas Waldhauser, director of joint force development at Joint Staff J7, has been nominated to serve as the next commander of U.S. Africa Command. Defense Secretary Ashton Carter said Thursday Waldhauser’s nomination, if approved by Congress, will result in a promotion to the rank of general. Waldhauser joined the U.S. military in 1976 as an infantry officer and has since held company grade assignments with the U.S. Marine Corps. He deployed to the staff of the commander for the Marine Corps Central Command during Operation Desert Shield/Desert Storm and served as the battalion landing team commander of 3rd Battalion, 2nd Marine Regiment. 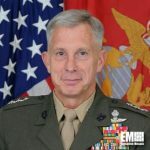 Waldhauser took the roles as commanding general for the Marine Corps Warfighting Laboratory and as deputy commander for the Marine Corps Combat Development Command when he was appointed as brigadier general in 2003. He was promoted to the lieutenant general rank in 2009 and served as the deputy commandant for Plans, Policies and Operations from 2009 to 2010. Tags Ashton Carter featured govcon Joint Staff J7 military nomination Thomas Waldhauser U.S. Forces AFRICOM U.S. Marine Corps.